Ellen Moody is a LibraryThing Author, an author who lists their personal library on LibraryThing. See Ellen Moody's author page. 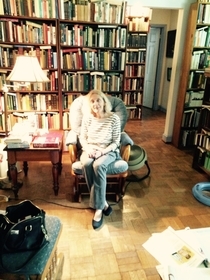 About meEllen is a literary historian-scholar, writer, and college teacher, now widow; with Jim Moody, her husband of 45 years, a working library for them both emerged. She loved and still buys art books, reads French and Italian. Ellen has written and published a book about her experiences in cyberspace reading Anthony Trollope with other people: Trollope on the Net. (The reader will find many books on Trollope in the catalogue and online essays on cyberspace linked into her homepage.) Her husband Jim, was a mathematician turned computer scientist. He died on October 9, 2013. He opened this account, began the catalogue and loved to collect books. Switch to first person: I continue in his honor and to keep him alive by doing what he would have liked. He loved music and I have many music books; the science, math, philosophy and more historical sections of our library were bought by him. We both loved and bought poetry, books of letters, memoirs, biography, and travel books. "La bibliothèque devient une aventure" (Umberto Eco quoted by Chantal Thomas, Souffrir). My life is a continuation of our play without him there. I see him in my dreams and experience him in my memories. I keep our library alive. Rien a faire? About my libraryTogether we bought books as central to our lives -- and the collection goes back further as it includes Ellen's college books and books she took from her parents' house. We've built our lives out of our shared worlds of books. "Our books, dear Book Browser, are a comfort, a presence, a diary of our lives. What more can we say?" (Carol Shields, Swann).